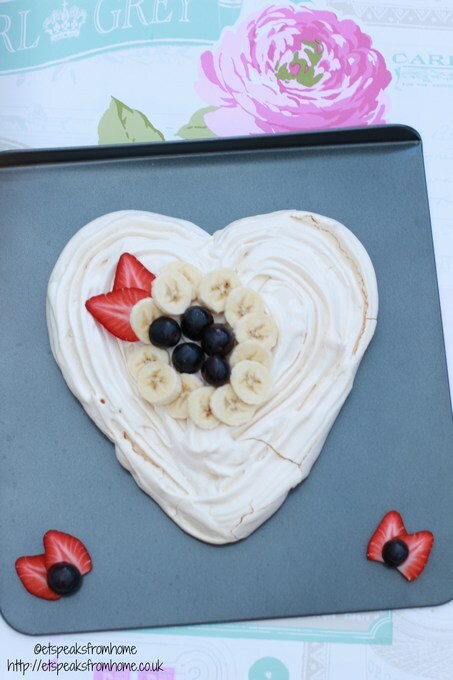 This Valentine’s day, why not try to bake your own meringues, pavlova or roulade for your loved one instead! It is cheap as it requires minimal ingredients and it is delicious! However, do allow plenty of baking and cooling time. 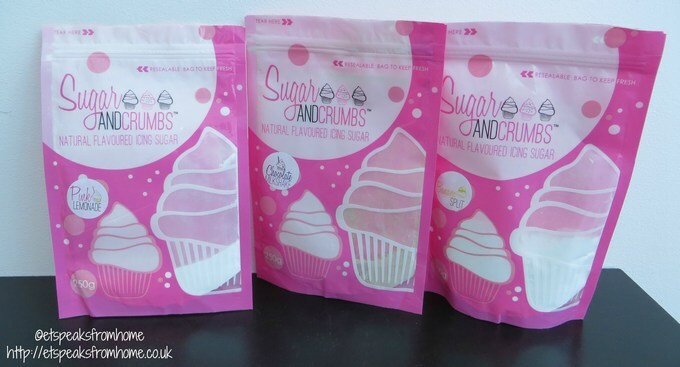 I am so delighted to receive three different natural flavoured white icing sugars from Sugar and Crumbs to try. They are Pink Lemonade, Chocolate Milkshake and Banana Split. They come in a 250g resealable bag which is very handy for storage. Over the past week, I had been using the icing sugars to bake pink lemonade with almond meringue, chocolate milkshake meringue with white chocolate and banana heart-shaped pavlova. 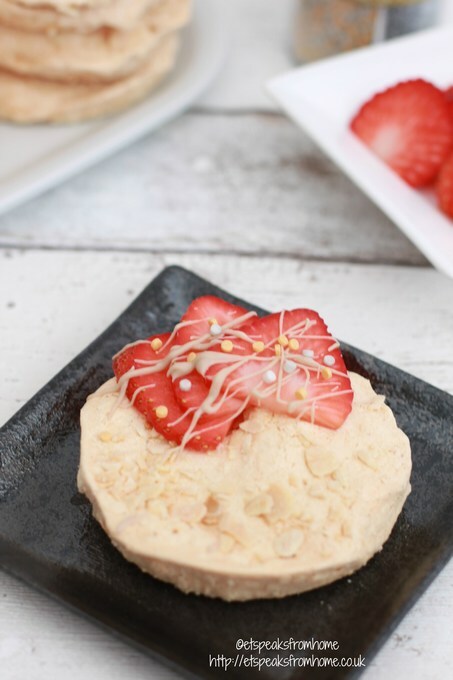 To bake a basic meringue is very simple. All you need are 4 egg whites and 250g caster sugar. For my pink lemonade and chocolate milkshake meringues, I replaced the caster sugar with icing sugar. Also I cut down the icing sugar to 230g instead. My husband finds it quite sweet but my children don’t. So do adjust to your own preference. 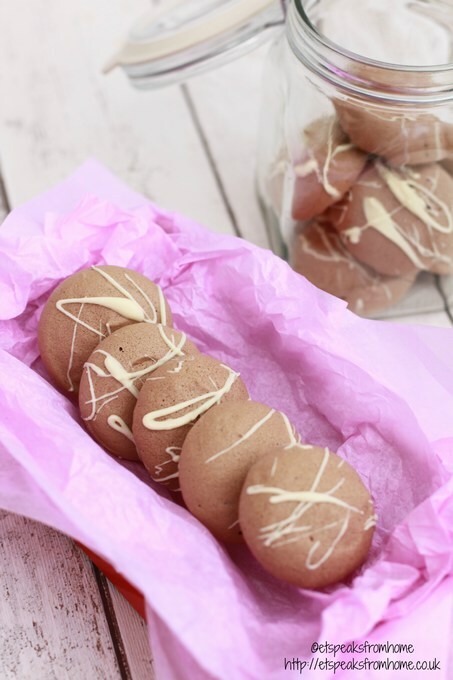 The method that I used to make the pink lemonade and chocolate milkshake meringues, is from BBC Good Food. Whisk the egg whites until it resembles a fluffy cloud and stands up in stiff peaks when the blades are lifted. Add half of the icing sugar in small batches. I placed the icing sugar inside my OXO baking’s dusting wand. It sieves the icing sugar at the same time. Do not over beat the mixture. Sieve the rest of the icing sugar in three to four batches into the mixture and use a spoon/spatula to fold it in. The mixture should look very silky and smooth. Place it in a piping bag. For the pink lemonade, I used a circular cookie cutter as a guide and piped it inside the cutter. 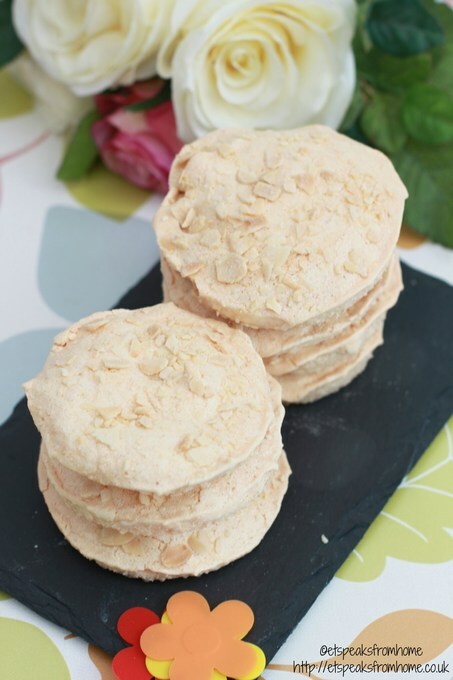 Then add crushed almond slices on top. For the chocolate milkshake, I used a round piping nozzle. 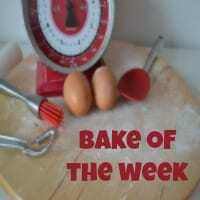 Preheat the oven to 100°c, bake it for 1 hour 30 minutes then turn off the oven. Leave the meringues in the oven for a few hours before removing them. For the chocolate milkshake, I melted a few pieces of white chocolate in the microwave and used it to decorate the meringues. Wait until the white chocolate hardens before you place the meringues in a tight sealed container. My family and friends all like the flavours especially the chocolate milkshake. Both tastes delicious. The lemonade is very refreshing whilst the chocolate milkshake is very chocolaty. Last year, I was so fortunate to learn how to bake pavlova with Nick Coffer. So I am using his recipe to bake. You can read more about my cooking session with him here. Slowly add the icing sugar until it looks glossy. Place it in a piping bag and pipe into a heart shape. Preheat oven to 130°C. Bake for 1 hour 15 minutes, turn off the heat and let the meringue cool completely inside the oven. Add your own preferred fruits on it. I didn’t add any cream on this picture as my daughter doesn’t like cream. Do add cream when serving. This banana split flavour is quite mild and does not taste as strong as the other two. The cream and fruits had definitely overpowered the flavour. Probably banana split will be suitable for smaller bite size meringues instead. I would definitely recommend the Sugar and Crumbs icing sugars. They have so many unique flavours and they taste great. Disclosure: I have received the samples to do an honest review.